If there is one thing we’re more excited for than the big game itself, it would have to be the menu that accompanies the event. After all, Super Bowl Sunday is essentially a license to splurge on all the decadent dishes we would otherwise find ourselves avoiding—hearty dips in bread bowls and loaded nachos immediately come to mind. Whether you’re entertaining a crowd or kicking back for a (relatively) low-key night at home, it’s only appropriate that you celebrate with all the right fixings. Read on for the mouthwatering recipes we’ll be serving during the Super Bowl. Start the night off with this insanely satisfying combo, featuring a surprising crunch you can’t pass up. No party’s complete without a hearty bowl of this refreshing side. These bite-sized starters feature a heavenly mix of spicy buffalo chicken, garnished with a touch of crispy bacon. We can’t think of anything more delicious than this thick bean chili, topped with spicy guacamole, and chipotle sweet potato fries. 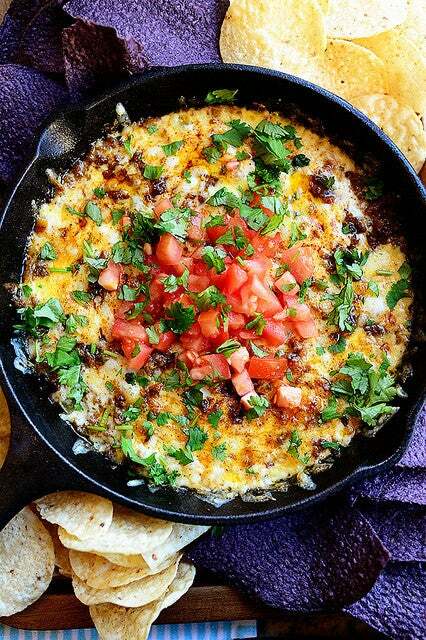 This skillet-baked version features molten layers of gooey cheese, spicy sausage, and freshly diced veggies. A simple pre-game snack, baked to crispy, parmesan-crusted perfection. Layers upon layers of mouth-watering toppings, fully-loaded with spicy salsa. A modern revamp of a delicious Vietnamese staple, with a heaping dose of sriracha. It’s all in the name. These medium-hot wings are packed with flavor and spicy undertones. These simple sliders, garnished with a rich green pepper aioli are what we’d like to call a touchdown. A flawless coupling we can’t wait to sink our teeth into. Need we say more? A childhood classic makes a comeback, with bold new flavor additions you can’t pass up! We can hardly take our eyes off this mouth-watering combo, coated in a decadent layer of sea salt speckled caramel. Warm notes of cinnamon, and a rich, chocolate drizzle complete this sweet and salty blend.